Trial Scanner Available, Call Now! 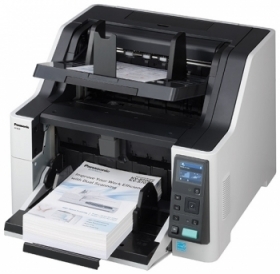 The KV-S8127 delivers incredibly high scanning speed, 120 pages per minute. You can switch seamlessly between manual and automatic feeding or take advantage of the Auto Rescan and Auto Preview functions to bypass inputting complicated scan settings, and to review and adjust images without having to rescan. From double-feed detection and double-feed skip functions to staple and jam noise detection, the KV-S8127's intelligent feed control limits time wasted on paper-feed errors.